Rumored to be longtime rivals, shock rockers Alice Cooper and Marilyn Manson have just announced that they’ll join forces for the first time ever for “Masters of Madness: Shock Therapy,” a co-headlining summer tour. Manson has been touring heavy all year in support of last year’s Born Villain and Cooper’s most recent release is 2011’s box set Old School: 1964-1974. Calling from his home in Phoenix where it was “comfortable 97 degrees,” Cooper talked about the upcoming tour and how he hopes that his political differences with Manson won’t be an issue. You and Marilyn Manson are on tour together for the first time ever. Was there ever a rivalry between the two of you? I think there was some jealousy in the press. Of course, I saw the humor in it. I said something like, “Here’s a guy with a girl’s name and makeup. I wish I would had thought of that.” It was meant as a jest. I wasn’t’ knocking him. He does what he does. We met for the first time in Transylvania. How weird is that? We were playing a festival. He came up and did “I’m Eighteen.” I did “Sweet Dreams” with him on his stage. On this tour, I don’t know Marilyn very well. I understand his show is pretty good. Our differences, well, I try not to ever let politics and religion come into it. Politics is something I don’t want to talk about and I’ve been open about religion and what I believe and that hasn’t come up yet. If it does, I am who I am and who he is who he is. Will you perform any songs together? We don’t know yet. We haven’t even gotten into rehearsals yet. I don’t know why in certain cities we wouldn’t. I don’t think I will do any songs on his stage because that would ruin the impact of Alice coming out in the second half of the show. It would be hard for me to give up the image right up front. I wouldn’t mind him coming out and doing “School’s Out,” which is usually what we close with. The audience will get two Alice deaths. How many people look at their shows in terms of how many deaths they get? Do you have a new stage show? We’re each doing 70 minutes. It’s a bit of a Frankenstein. It’s a large piece of the last show and we’re stitching in part of an older show. We’re adding something, an extra theatrical piece. I doubt if they’ve ever seen me do the guillotine. I will throw that in because it works really well with the show. I won’t give up the new special effects that we have in the show. The audience will get two Alice deaths. How many people look at their shows in terms of how many deaths they get? What was it like putting together Old School? I am lucky that I have people working for me that are way into retro Alice and what happened then. Honestly, I don’t live in the past at all. As much as I love the old songs and I have fun talking about the things that happened with Keith Moon and John Lennon and Groucho Marx and Salvador Dali and all the insane people, I don’t live there at all. “I’m Eighteen” seems like it signified a change in direction for the band. What exactly inspired that song? It was all Bob Ezrin. We were doing that song. It was a ten-minute jam. It was something we used to warm up with. He heard it and he heard the root of that song. Bob was our George Martin. He’d come in and go, “Okay, dumb it down. Take this section and that section out.” We would play it again. He would go, “Still too smart.” Pretty soon it was just big power chords against that lyric. He said, “Now it’s powerful.” He was dead right. We always thought powerful was getting as many guitar solos in as we could and trying to sound like The Yardbirds. He was telling us that the power in the song was that I’m eighteen and I’m dumb and I like it. That’s the hook. Back I those days, there was a Top 40. When you got a song in the Top 40, you were up against Frank Sinatra, The Beatles, The Supremes, Simon and Garfunkel and to get a song in the top 40 was almost impossible for a band like us. We had created a new sound that was amazing to us that we were in the Top 40 and then we had 13 more hits. That was because of [producer] Bob Ezrin. Back then, he was young and full of energy. He had ideas about what sounded good. You have to trust his ears. I don’t know why we listened to him but we did. We didn’t listen to anybody. We didn’t even listen to Frank Zappa. But [Bob]was right: “School’s Out,” “Eighteen,” “No More Mr. Nice Guy” were all hits. He understood that we were a band with this image and great hooks, but there was no signature. When you hear a Doors’ song, you know it’s Jim Morrison and Robbie Krieger and Ray Manzarek on keyboards. He said, “When I hear an Alice Cooper song, it could be the Electric Prunes or it could be the Strawberry Alarm Clark.” He gave each guy a signature. When you hear “Love It to Death,” you know it’s Alice Cooper. When you hear “Pretties for You,” it could be anybody. We were these geniuses. We were a Detroit band with good ideas. Looking back on it, which of your tours was the wildest? What stands out? We were in the catbird seat. Everyone was afraid of the words show biz. Rock ‘n’ roll was its own thing. It wasn’t supposed to be Frank Sinatra or the Osmonds. Alice Cooper took that glitz and added horror to it and added hard rock to it. We turned it into something else. We turned it into the arena rock show. We were gambling that that was going to work. People hated the idea that it was glitzy. There was this villain up there that was in control of this whole circus and there was something really appealing about it. People would come to see our show and they wanted to get lights like we had. I think we were the first band that had hanging lights. It changed everyone’s idea of what a rock show was. In the beginning, if you were so far out on a limb, you were going to be either the biggest idiot or the biggest genius. We were these geniuses. We were a Detroit band with good ideas. But the band got together in Phoenix. We were thrown out of Los Angeles. Los Angeles was grooving. It was trippy sounds. Alice Cooper was this monster that had no problem being A Clockwork Orange before A Clockwork Orange. That scared the hell out of people on LSD which was the entire population of Los Angeles. We played a festival in Detroit with Iggy and the Stooges and the MC5. We did our show and they loved it. They ate it right up and when they realized I was from Detroit, I was the golden son. Iggy and MC5 were the two bands but then it was like the unholy trilogy. There is a new band that’s crazier than Iggy and more of a show than MC5. They welcomed us with open arms and we moved there and we became a Detroit game. You’ve said that you won’t let Mick Jagger beat you in the longevity game. The guy is still out on tour. Do you still feel that way? Alice Cooper is an icon. Despite his age, he still is a live act and he still puts really good albums. 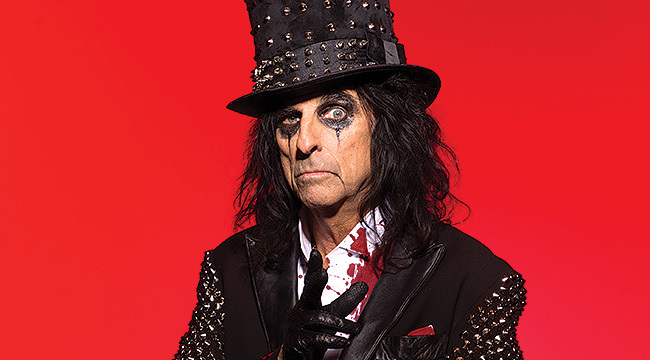 I loved his last studio album, Welcome 2 My Nightmare (not the same as Welcome To My Nightmare) Have any of you heard stuff like The Last Temptation, Brutal Planet, or The Eyes of Alice Cooper? The guy still can get it done. Although we’re going back two decades, I’ll agree that The Last Temptation is a great album. A definite gem in the Cooper catalog!